Shamelessly breaking with your resolution to eat better only a few days into 2019 just got even easier, all thanks to a huge new deal from Pizza Hut. The ubiquitous pie purveyor is slashing 50% off the price of all of its pizzas every day for the next week. So, uh, better luck next year? From Wednesday, January 2, through Tuesday, January 8, you can get any menu-priced pizza for half off if you order through Pizza Hut's website or mobile app, a spokesperson told Thrillist. While the exact price of pizzas will vary slightly depending on where you live, it looks like you can get your hands on large hand-tossed cheese pizzas for as low as $6.50 each with the discount. Large one-topping pizzas and specialty pies appear to cost a little over $7 to $9, respectively. 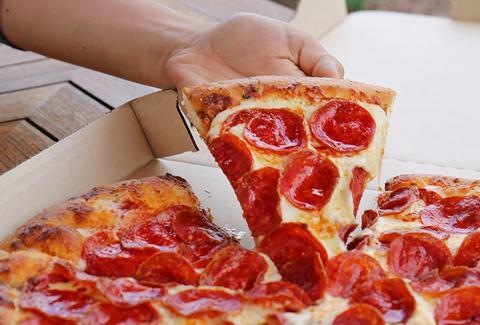 Cheap pizza just got cheaper. Happy new year indeed. The discount automatically applies at checkout, so all you have to do is select the pizza and toppings of your choice. But to be clear, you can't just show up at your local Hut and demand the discounted pizzas in-person. You have to order them online for pickup or delivery, the latter of which could be a great thing if you've resolved to avoid human interaction and eat lots of pizza this year. That'd be kind of weird, though.